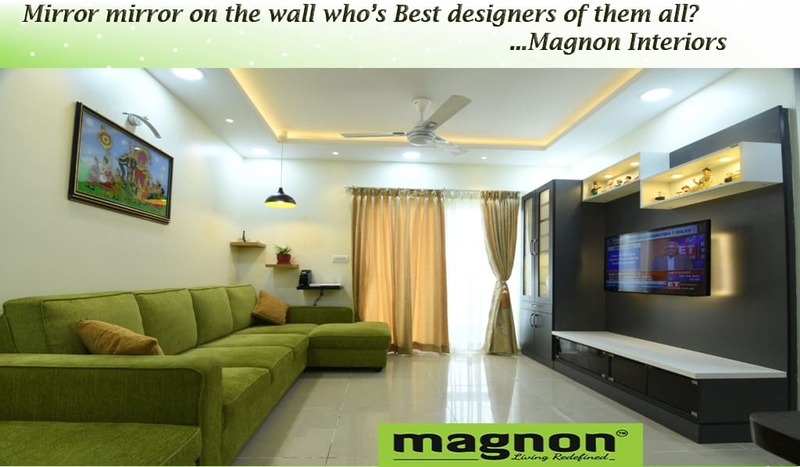 Magnon, one of the best designers in bangalore for interior, will explain in this blog about How Mirrors Can Do Wonders In Interior Designing. Mirrors have gained a high five from all the interior designers out there. As one of the most used decorative pieces, mirrors are highly versatile which makes them the best designing material. Whenever we look at the latest trends in any style of interior designing, we find mirrors getting a space in the list. The best thing about them is that they never go out of trend and you can have them for a lifetime. The magic of mirrors can be seen in any corner of your home. They are not only used to enhance the beauty of your home but also come handy when you have to tackle some issues like lack of natural lighting and space problems. Here is how the mirror vibes give a completely mesmerizing look to your home. Mirrors have been used to reflect light for centuries. You can buy a plain or decorated mirror as per your choice, and hang it opposite to your window. The outside brightness from the window will strike the mirror, and it will be spread in the whole room. The best thing is about mirrors is that they tend to absorb and reflect maximum daylight and brighten your place to the max. When you play the color theory with mirrors, you have something beautiful turning out. Mirror with colorful stones around them looks classic and elegant at the same time. You can hang such mirrors above the washbasin to create an inspiring look. You can also choose a single color according to the theme of your bedroom to hang it in the bedroom. The home interior decors in Bangalore say that the best use of mirrors is adding space. Big sized mirrors on the wall expand your narrow rooms by creating an illusion. As per the suggestions of professionals, the best kind of mirror for this purpose are rectangular mirrors. You can hang them length or width wise according to the shape of your room. When you follow a particular theme while decorating your interiors, you can easily add your personal style until everything goes well with the idea. If you are adding decorative items such as wallpaper, antique pieces, artifacts, and metal sculptures, a mirror can easily be the partner. You can reflect your taste in home decor by styling the mirror according to the other pieces in the room. We all hate those empty walls because of the dullness they occupy. Unless the paint on the wall is textured, you need something to enrich the walls. We suggest you hang a tall mirror on the empty wall and it will create the whole look. If you want something more dramatic, decorate the sides of the mirror with stones, color strips or glitters. However, places like drawing rooms look better with plain linings such as wood or plastic. You can hang a rectangular, circular or even an oval mirror as per your interest. When you are tired of finding something suitable to make the focal point of your room, mirrors come to rescue. They not only work the best but also keep other things linked. You can place a mirror above the fireplace, or table and your desired look will be there in no time. Even if there is no fireplace, a mirror alone can serve the purpose. We all have windows in the rooms which we want to style differently. Traditional window styles give you a good option to use mirrors in your air entryway. Windows which have a shutter or separate panes can be the best choice because you can have mirrors in the gaps. However, you can use glasses in place of a mirror to create an illusion of a mirror making a passage for light. You can choose mirrors of different shapes and sizes according to the look you want to create. The luxury interior designers in Bangalore say that hanging differently sized mirrors on a plane wall can create a mesmerizing look if you do it smartly. You can buy small sized mirrors and hang them in such a way that it creates a look of wind chain. Have you seen an unusually shaped mirror in the market? Get it if you loved because it will create a unique and classy look. Creating balance is one of the most vital things in a room. Also, it is one of the best things you can do with mirrors. Mirrors develop of sense of harmony when you use them in pairs on the walls. What about having all mirror decoration in a simple room? You can do such things in a dark place to lit it up in no time. You can use oddly shaped mirrors decorated with stones and colors in different part of a room, and it will appear like a constellation. How about pasting little mirrors on a black wall and that will glow in the dark like the sky. The interior decorators in Hebbalsuggest you do as many experiments as you want without underestimating the value of theme. The color and style of your theme mean a lot. If you are following a vintage theme, all the decoration around the mirrors will seem better in wooden form. Why should indoors have all the fun? You can have a mirror in outside areas such as balcony too. Colorful flowers and a simple plain mirror in the middle, seems impressive, right? Nothing counts better than a freestanding mirror. If you have no idea what to do with your bedroom, a large-sized mirror in rectangular shape will do everything. It will serve as your go-to dressing mirror, plus it will do all the lighting and space jobs. You can stand it over the floor or use a low height table like thing below it.